I am on a roll lately with the great slow-cooker recipes. Then I decided to experiment with making lasagna in the slow cooker. And it was really good. I made my version vegetarian, but it should work to add cooked ground meat in the layers, if you like that sort of thing. There was a bit of work involved in this one. 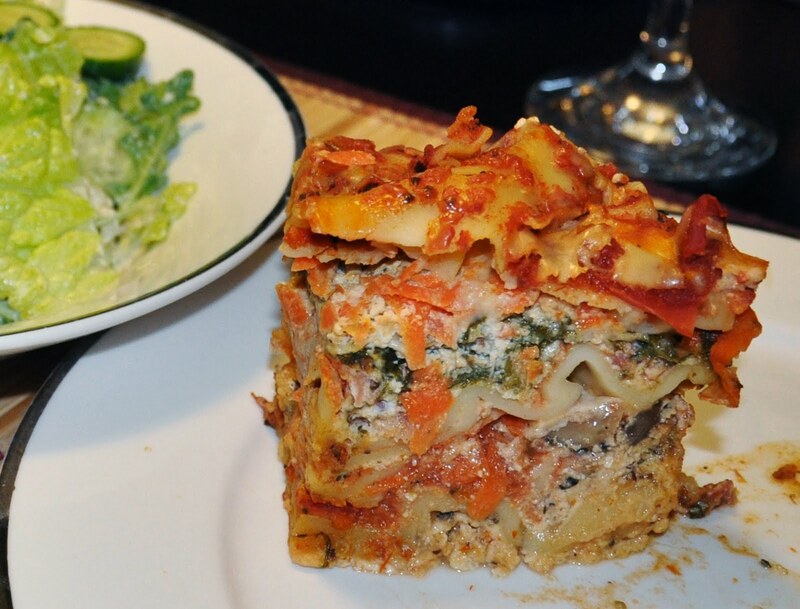 Which is typical of lasagna. I tried to cut down on that by using pre-washed bagged spinach and pre-cut bagged mushrooms. If I did not already have carrots at home I would have bought the pre-shredded ones. It did not add too much time to peel and grate the ones I already had. Same for chopping the onion. Mix first 11 ingredients in a large bowl. Set aside. Get all your veggies open, cleaned prepped and ready to use. Spoon about a cup of the egg-cheese mixture into the bottom of the slow cooker then sprinkle with about 1/2 cup of the red sauce. Layer noodles over the sauce in a single layer, breaking into pieces if needed to make them fit. Sprinkle half the carrots, half the onion and all the mushrooms over the noodle layer, then sprinkle on about a third each of Parmesan and mozzarella. Spoon over about a third of the remaining egg-cheese mixture and then about a third of the remaining red sauce. Make another layer of noodles. Cover that layer with spinach and remaining onion and carrot, then add another third of the Parmesan and mozzarella. Spoon on another third of the egg-cheese mixture and red sauce. Add one more layer of noodles. Cover with all the remaining egg-cheese mixture and remaining red sauce. Sprinkle on remaining Parmesan and mozzarella. Cook on low setting for 5-6 hours. This was tricky to scoop out the first night. The noodles were a little "loose" in the sauce, so it did not want to stand up. But it tasted really good! And it was even better reheated for dinner the second night. And it stood up nicely then, as seen in the picture. This is not a slow-cooker meal I can make on a weekday since it cooks in only 5-6 hours. On work days I need 8-10 hour recipes. But it was a great thing to start at midday on a day off and just forget about until dinner. I got it all ready and started while Ben napped. I paired it with Caesar salad and a good wine for dinner. I liked the blend of red and white sauces in this. I was just creamy enough, but not too rich. And the veggies were terrific. If I had anything like ham or prosciutto, I would have chopped that up and added it to one of the layers. I think that would be good. I thought about doing the ground meat, but that was one more step and would have dirtied another pan. With the veg version it was all just done right in the cooker. can't wait to try it. thank you for sharing!!! Love crock pot recipes!